Female jumping spider, size around 6 mm, made with magnification factor 3 and f/14. The jumping spider family (Salticidae) contains more than 500 described genera and about 5,000 described species, making it the largest family of spiders with about 13% of all species. 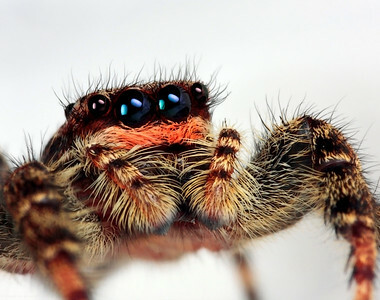 Jumping spiders have good vision and use it for hunting and navigating. They are capable of jumping from place to place, secured by a silk tether. Jumping spiders are active hunters, which means that they do not rely on a web to catch their prey. Instead, these spiders stalk their prey. They use their superior eyesight to distinguish and track their intended meals, often for several inches. Then, they pounce, giving the insect little to no time to react before succumbing to the spider's venom. They are capable of learning, recognizing, and remembering colours (source: Wikipedia). Rather large jumping spider, made with magnification factor 3 and f/16. Small jumping spider, size around 6-7 mm, which has caught a black bean aphid. The photo has been made with magnification factor4 and f/14. The jumping spider family (Salticidae) contains more than 500 described genera and about 5,000 described species, making it the largest family of spiders with about 13% of all species. 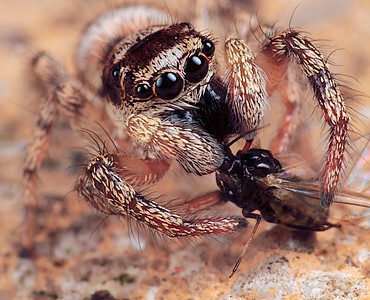 Jumping spiders have good vision and use it for hunting and navigating. They are capable of jumping from place to place, secured by a silk tether. Jumping spiders are active hunters, which means that they do not rely on a web to catch their prey. Instead, these spiders stalk their prey. They use their superior eyesight to distinguish and track their intended meals, often for several inches. Then, they pounce, giving the insect little to no time to react before succumbing to the spider's venom. They are capable of learning, recognizing, and remembering colours (source: Wikipedia). A portrait of a jumping spider, made with magnification 6 and f/11. 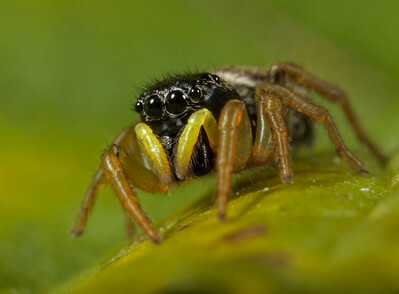 The jumping spider family (Salticidae) contains more than 500 described genera and about 5,000 described species, making it the largest family of spiders with about 13% of all species. 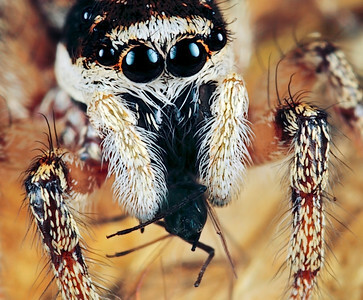 Jumping spiders have good vision and use it for hunting and navigating. They are capable of jumping from place to place, secured by a silk tether. Jumping spiders are active hunters, which means that they do not rely on a web to catch their prey. Instead, these spiders stalk their prey. They use their superior eyesight to distinguish and track their intended meals, often for several inches. Then, they pounce, giving the insect little to no time to react before succumbing to the spider's venom. They are capable of learning, recognizing, and remembering colours (source: Wikipedia). A frontal view of a rather large jumping spider, made with magnification 4 and f/16. The jumping spider family (Salticidae) contains more than 500 described genera and about 5,000 described species, making it the largest family of spiders with about 13% of all species. 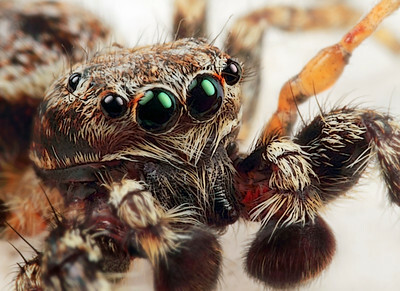 Jumping spiders have good vision and use it for hunting and navigating. They are capable of jumping from place to place, secured by a silk tether. 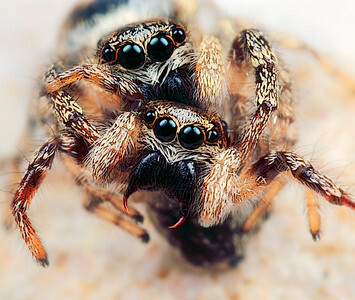 Jumping spiders are active hunters, which means that they do not rely on a web to catch their prey. Instead, these spiders stalk their prey. They use their superior eyesight to distinguish and track their intended meals, often for several inches. Then, they pounce, giving the insect little to no time to react before succumbing to the spider's venom. They are capable of learning, recognizing, and remembering colours (source: Wikipedia). A portrait of a zebra spider which catched a black bean aphid (Aphis fabae). The picture has been made with magnification factor 5 and f/13, using a Canon 7D and the Canon macrolens MP-E 65mm/f2.8 The zebra spider, Salticus scenicus, is a common household jumping spider. Like other jumping spiders, it does not build a web. It uses its four pairs of large eyes to locate prey and its jumping ability to pounce and capture it. Zebra spiders are often noted for their 'curiosity' when observed by humans; many seem aware of their audience and seem to respond to observation by raising their heads and studying the observer. Female zebra spiders are 5–7 millimetres long and males are 5–6 mm . 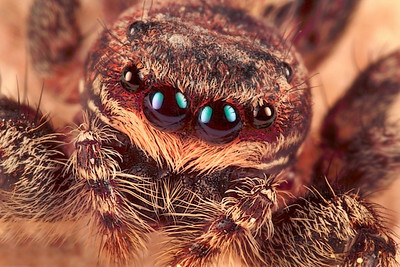 The most distinctive feature of these spiders is their two very large eyes, which is typical for jumping spiders. Although they have eight eyes, the two at the front are the largest and give them excellent binocular vision. These tiny spiders are black with white hairs that form stripes. Aphis fabae is a true bug in the order Hemiptera. Common names include blackfly, black bean aphid, bean aphid and beet leaf aphid. It is a widely distributed pest of agricultural crops (source: Wikipedia). A frontal view of to mating jumping spiders, made with magnification 4 and f/14. The jumping spider family (Salticidae) contains more than 500 described genera and about 5,000 described species, making it the largest family of spiders with about 13% of all species. Jumping spiders have good vision and use it for hunting and navigating. They are capable of jumping from place to place, secured by a silk tether. Jumping spiders are active hunters, which means that they do not rely on a web to catch their prey. Instead, these spiders stalk their prey. They use their superior eyesight to distinguish and track their intended meals, often for several inches. Then, they pounce, giving the insect little to no time to react before succumbing to the spider's venom. They are capable of learning, recognizing, and remembering colours (source: Wikipedia). 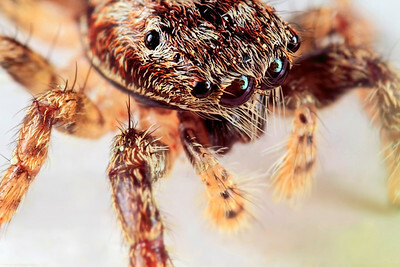 A portrait of a jumping spider, made with magnification 6 and f/11. The jumping spider family (Salticidae) contains more than 500 described genera and about 5,000 described species, making it the largest family of spiders with about 13% of all species. Jumping spiders have good vision and use it for hunting and navigating. They are capable of jumping from place to place, secured by a silk tether. Jumping spiders are active hunters, which means that they do not rely on a web to catch their prey. Instead, these spiders stalk their prey. They use their superior eyesight to distinguish and track their intended meals, often for several inches. Then, they pounce, giving the insect little to no time to react before succumbing to the spider's venom. They are capable of learning, recognizing, and remembering colours (source: Wikipedia).